2008 build, 2009 model year Robertson & Caine Leopard 46 Owners Version found in great condition. The vendors of this Robertson and Caine Leopard 46 have undertaken an extensive refit and maintenance program over the last three years, including, replacement sails, new standing rigging, new sail drive seals, replacement chart plotters, new dinghy, new lithium batteries to name just a few items. 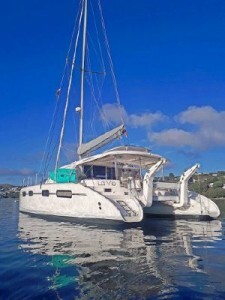 This Leopard 46 is found in excellent sail away condition ready for her next adventure. The boat will be located in Auckland until 28th April, when it will set off for Fiji. ‘LA VIE’ has been meticulously maintained, and the on-going upgrades/ replacement list will change as/ when required. Current owners ensured only the best quality of equipment and replacements. Ready to cruise around the South Pacific and beyond!